The attention paid by Rossato to after-sales service is aimed at providing customers a service of technical assistance able to give continuity to the quality and efficiency of Rossato, relying on a network of professionals present throughout the national territory, organized and constantly updated. Otherwise contact your dealer - installer or service center. please contact your dealer / plumber / maintenance service. 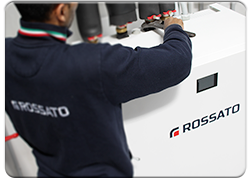 Search the service center Rossato in Italy near you. Manuals and data sheets for each product. technical guides divided by topics of our products.